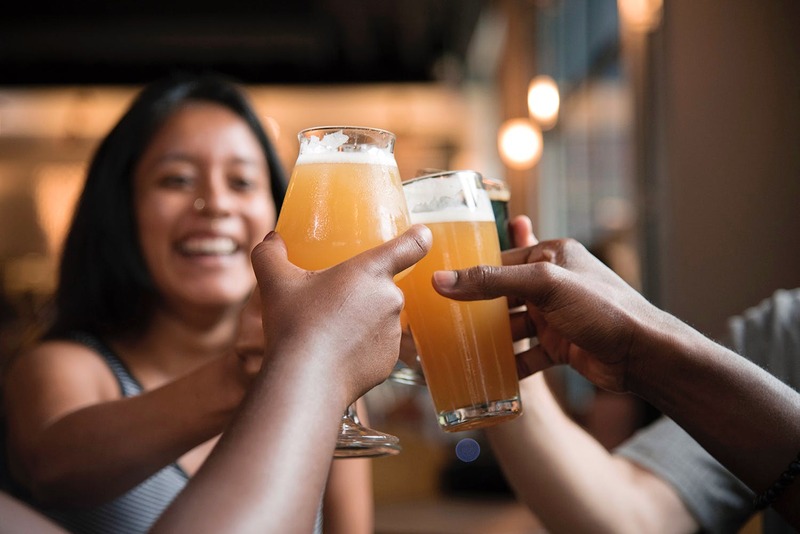 Whether you love taking your squad for a group party or love grabbing drinks during the happy hours, our city is full of awesome drinks deals. Don't know any good deals? Here is a list of top happy hours in Hyderabad that'll make you go bonkers. Let's get chugging, shall we? Cocktail lovers, it cannot get better than this. By The Bottle in Jubilee Hills has awesome Happy Hours called The 79 Menu where you can grab a beer, whiskey, vodka, rum, gin, six types of cocktails and also mocktails at INR 79 each. We thought this was too good to be tried and decided to check it. It starts at 12pm and closes at 6pm, but we recommend getting here by 4pm or just as the sunset begins if you are settling for outdoor seating. Known for its bizarro ambience and chill music scenes, Amnesia is one of those pubs that's popular with college students (above 21 years of age, though). They have a killer happy hours menu where you can score drinks and finger food at INR 99 only. Only two drinks (Kamikazi and Tequila) are priced at INR 129, but we’ve done the math, and no combination of a drink and appetiser will cost you more than INR 228. This menu is valid between 12pm and 7pm from Monday to Saturday, so no matter what day of the week it is, drive away the blues! With wall art and lights suspended from the ceiling, Thirsty Owl by Revolt 2.0 has amazing happy hours with drinks and food at INR 79 only. From 4pm-9pm, you can grab Smirnoff, Bacardi White, Kyron, Tuborg Green at INR 79 each and you can also pair them with Crispy Pepper Chicken, Fish Fingers, Chilli Chicken, and more starters at the same price. A few drinks like Budweiser, Black Dog 8 Years, KF Ultra, and Carlsberg are priced at INR 129 though. But nothing at prices that'll burn a hole in your pocket. Drinks at INR 69? Yaaaas! Club Rogue in Jubilee is the most happening during its happy hours between 12pm to 7pm. You can grab cocktails like Gimlet, Cuba Libre, Daiquiri at INR 69 only. There's also Old Monk, Smirnoff, Captain Morgan, Kingfisher Premium, and more that you can grab at the same price. Plus, we really do love the ambience here and go here whenever we are broke. Heart Cup Coffee in Kondapur has fun happy hours from 12pm to 7pm where there is a 50 per cent off on all drinks. Now, isn't that a deal worth dragging your entire squad for? We recommend hitting up the bar on Thursdays as they have Karaoke nights and Ladies night. Free drinks for ladies calls for a special girls night, amirite? Vapour Brew Pub in Jubilee Hills is now 36 Downtown Brew Pub, and their happy hours are called Happy 127. The name is a giveaway as you can grab delicious starters and drinks at INR 127 only. This starts at 1pm and ends at 7pm, and you get more than five types of craft beer at INR 127 only. You can always go for the cocktails along with starters like Ajwani Fish Tikka, Chicken Wings or Miryala Kodi Vepudu (Pepper fried chicken). Insomnia in Jubilee Hills is yet another happening bar in this location, and their happy hours (which is called as Zero Hours) begins at 6pm and ends at 8pm. A sweet deal of 1+1 on drinks is what drags us to this bar. The drinks are otherwise priced a little on the higher side, so if you've been waiting to this place out, the best hour to go is 6pm. Love yourself some gourmet cocktails? Barcelos in Forum Sujana Mall, Kukatpally has a 1+1 on the full bar during its happy hours. Which is between 4pm-8pm. We love their Portuguese cocktails like Ola (a rum-based drink with rose and betel leaves) or M’atacas (rum, gin, and coke). You can also try out their wide range of Sangria selections that boasts of over 15 types of sangria. You can also score classic and whiskey-based cocktails. Repete Brewery in Jubilee Hills is one of the best microbreweries in town and has a super vintage ambience that one cannot stop looking at. You can grab both drinks and food at INR 99-159 only during their happy hours (or Hoppy Hours). Their in-house brewed beer comes at INR 99 and we recommend you pair your beer with crispy corn or peri peri onion rings. They've got cocktails at INR 149 too.